Throughout January our SuitePreps section will be rolling out profiles for some of the top football recruits in Massachusetts, all leading up to National Signing Day on February 4th. 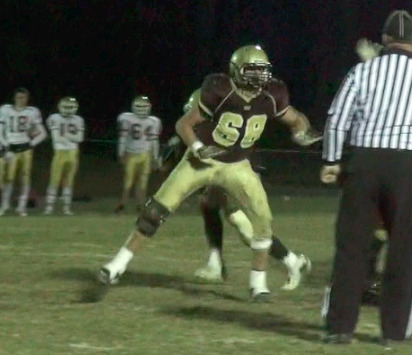 We continue our rundown today with Shepherd Hill's Chris Lindstrom, one of the most devastating two-way lineman the state has seen the last decade. Ranking Notes: All three recruiting services grade on the "star scale," awarding a player 1-5 stars, but ESPN and 247 also grade each prospect on a 1-100 scale to position them more precisely. Rivals has its own grading scale, which goes from 0-6.1. Early enrollees get some love in our profiles too! That's right, Lindstrom is actually already in Chestnut Hill taking classes and bulking up for his college career, but it's worth looking back on what was a fabulous run at Shepherd Hill. Lindstrom has been one of the state's most dominant two-way linemen the last two seasons, and his potential as an athletic guard had numerous Division I FBS schools interested in the former Ram standout. From a technique standpoint, Lindstrom is about as polished as they come, at least in terms of run blocking. In Shepherd Hill's Double Wing offense, he did just about everything, from straight drive blocking, to pulling on counters and traps. His athleticism and awareness made him the best pulling lineman in the state and, despite only weighing in at around 240 lbs, he still packed a ton of punch at the point of attack. The next step for his development will simply be bulking up. Jumping up to 248 lbs is a great start, but he'll likely need to add another 25 or so before he's ready to be a starting ACC lineman. Even then, he'll be considered a bit undersized. But, at 6'5'' he definitely has the room to fill out and add good weight, so a redshirt year and then some time in the weight room should take care of that. Getting enrolled early to get started on a college lifting program certainly won't hurt either. The other aspect of his game that will need to be worked on, just because he rarely did it at Shepherd Hill, is pass protection. As technically sound as Lindstrom is, it's a whole different animal to pass protect against live bullets, but with his long arms and quick feet, he has the potential to excel in both aspects of offensive line play. Because of his weight, don't expect Lindstrom to contribute for the Eagles immediately, but with some added bulk and experience, he has all the tools to be one of the nation's best interior linemen, and a future pro.